Join us for an evening of exploring your artistic talents while enjoying great wines and bites. We teamed up with Melissa’s Budding Artists – Paint Parties & DIY Events to bring you unforgettable experiences. 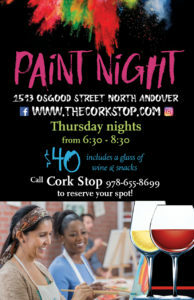 Melissa Guimaraes, local artist and art educator with over 15 years of experience, is thrilled to be teaming up with The Cork Stop to offer weekly paint partes and DIY events. Artists will have the evening to create fun and unique paintings and projects while Melissa instructs everyone with step-by-step guidance. Start with a blank canvas, loosen up, get creative and leave with your very own gorgeous painting or wood sign that you can be proud of! Themes include seasonal landscapes and holiday-related images on canvas and inspirational (sometimes inappropriate) quotes and classic home decor on wood. It’s easy, entertaining and rewarding! As you find your artist side with Melissa, let our wine director, Frank Stamos, explore wines from around the world with you to broaden your horizons. Admission includes a glass of wine and small bites. Additional wines and appetizers will be available for purchase.